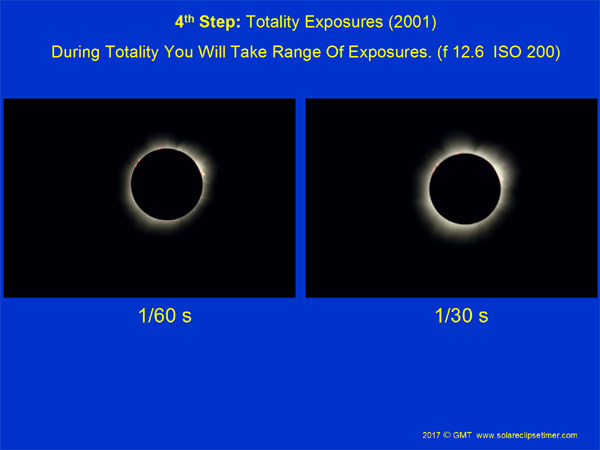 After you take your rapid exposures at a fast shutter speed going though C2 in to totality, you will then be in totality. Take a moment right now to enjoy the view of totality! Enjoy the reaction of the people around you! It's incredibly fun! Then, re-group and quickly get you photography done so you and continue to enjoy the eclipse with you eyes. It does not take long to get these exposures done, if you practice ahead of time, like in your living room right now! NOTE: It gets very dark quickly and your eyes do not have time to dark adapt! You will have difficulty seeing your camera settings, so you have to practice and know you gear. Practice in the living room with the light s really dim, I am serious! It does not get pitch black during totality in the umbra, it's not like night, but the first 15 to 30 seconds your eyes are not dark adapted and it is hard to see! Staying on the same fast shutter speed (for C2) take 1 or 2 more images for the chromosphere and prominences. Maybe even take an image one shutter speed faster to make sure you don't get corona bleaching out chromosphere. Then you have to start bracketing with slower and slower shutter speeds taking one exposure at each. With the new digital SLR cameras that have many more "in-between" electronic shutter speeds you really don't have to take an image at every shutter speed, you can skip and take every other shutter speed. Practice what you want to do. You can take exposures up to 7 or 8 stops (old time stops) slower to get more and more of the full corona exposed. Remember, this is 7 to 8 stops slower based on YOUR gear and the exposure test we talked about in Step 2. At some point totality will be overexposed. There is not a big difference (if any) with the corona structure at 60 seconds before mid-eclipse, mid-eclipse and 60 seconds after mid-eclipse. So I wouldn't really worry about taking exposures right at mid-eclipse. I suggest you get your corona images over with before mid-eclipse and when mid-eclipse is reached maybe take a horizon image and then continue to enjoy the eclipse with your eyes. You will be dark adapted at this point and be able to see you camera better, so at some point change your camera shutter speed back to the fast exposure for Baley's beads and the diamond ring affect for going out of C3. You have to be ready for this by the end of totality, change your shutter speed early so you don't forget, or you will mess up C3. 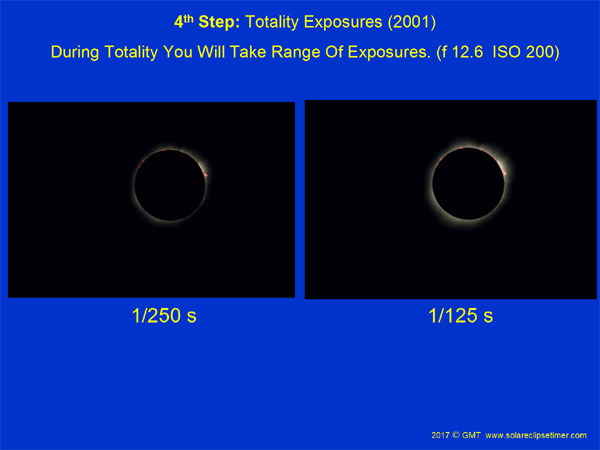 You can't expose C3 at totality shutter speeds. 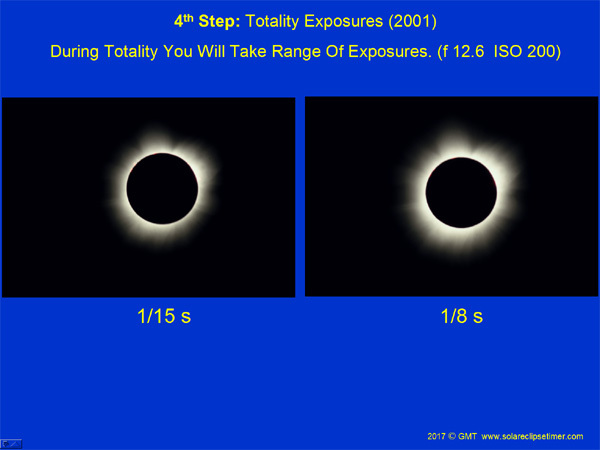 As I said in Step 3, about 12 seconds before C3 start taking rapid exposures until totality is over and it gets bright. You will not be able to see again! It gets bright fast and your eyes will now not be light adapted! Put your solar filter back on. From my images you will see the bracketing progression. My chromosphere shutter speed was either 1/500 or 1/1000, depending on the eclipse. I then bracketed slower shutter speeds during totality from that point. 1/250, 1/125, 1/60, 1/30, 1/15, 1/8, and at 1/2 second I have full corona (7 stops slower). After this the inner corona will be too over exposed. 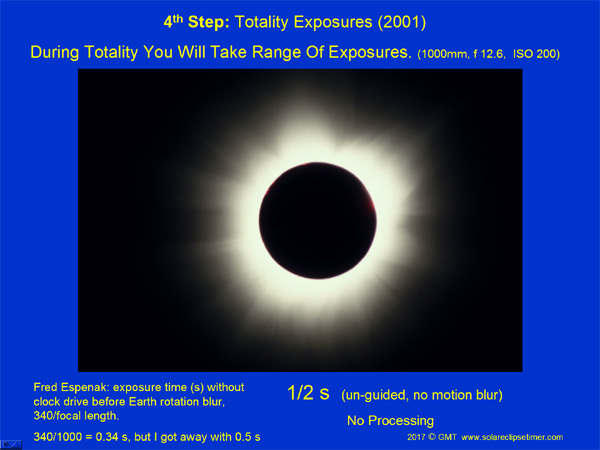 Fred Espenak has a formula for eclipse photography, without a clock drive, for the longest exposure (in seconds) before you get Earth rotation blur. That formula is 340/focal length. So for my setup it would be 340/1000 = 0.34 seconds. But I got away with 1/2 second (shooting ISO 200 slide film). So with the new digital SLR cameras, if you bump up the ISO to 400 or 800, or if your f-stop is faster that the 12.6 I was using, you will be decreasing your shutter speed 1, 2 or 3 stops and that will keep you under the 1/2 second shutter speed time with a regular camera mount. If you are using a clock drive you do not have to worry about this and you can use lower ISO's at 100 or 200. Daytime polar alignment can be rough, at these shutter speeds it has no great impact during totality.